Two types of keypads are available. AC-10S matches JK-DV, color video door station. Vandal resistant panel, zinc die cast, and tamper proof screws are included. Two independent relay outputs (N/O or N/C) are available. When same access code is programmed for both #1 and #2, two relays activate simultaneously. 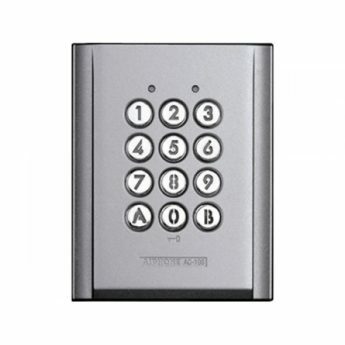 Keypad lockout: After too many incorrect access codes are attempted. Anti-tailgate: As soon as the door is closed after access is granted on #1, the door is locked even before programmed output time. Prevent sneak in. One push door release with external timer connection: While the external timer is on operation, access code is not required. Press “0” key only. Programmable #1 and/or #2. External output for alarming: When “Lockout” or “Forced entry” occurs, external output is available at #2. Two LED indicators show the status of the access control system. Illuminated keypad is easy to read.